Chill in refrigerator until needed. Shuck the oysters, saving the shells (they should be rinsed before shucking and washed thoroughly after shucking). To make the marinade, combine all other ingredients, stirring until the brown sugar is dissolved. Pour the marinade over the oysters and refrigerate overnight in a well-sealed container. Be sure that the oysters are covered by the marinade. Preheat the oven to 350°F. Pour salt in the baking dish (the salt will help keep oyster shells upright during baking). Place four shells on top of the salt and put one marinated oyster into each shell. Roast in the oven for 8 to 10 minutes, until plump. 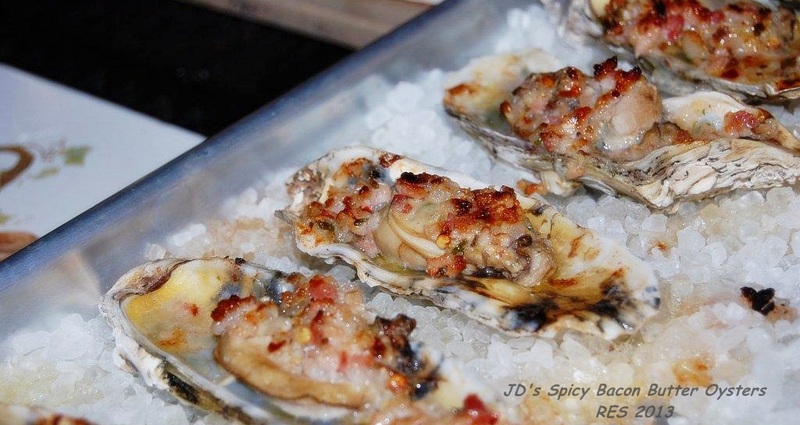 Transfer to a serving plate, garnish each oyster with a small piece of spicy bacon butter and serve immediately.